Summary: A battle of archers brings together multiple threads from past seasons and uses them to explore Oliver’s no-kill rule, in an ambiguous, complex, and action-packed hour. 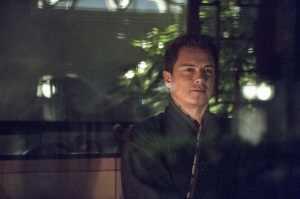 A furious Nyssa confronts Oliver about Sara. 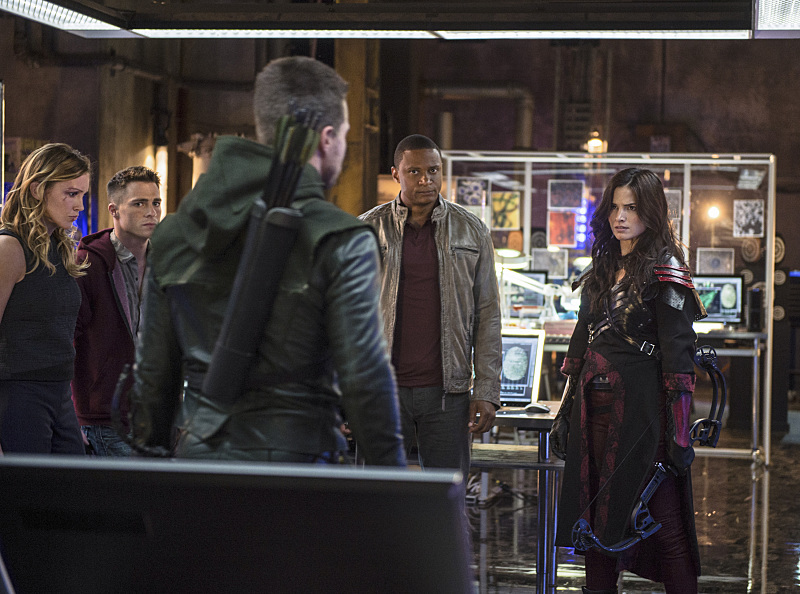 Nyssa reveals that Sara was in Starling to track Malcolm Merlyn, who is alive, and find the proof that she collected. Oliver and Nyssa join forces and go after the Dark Archer, intent on bringing Sara’s killer to justice. 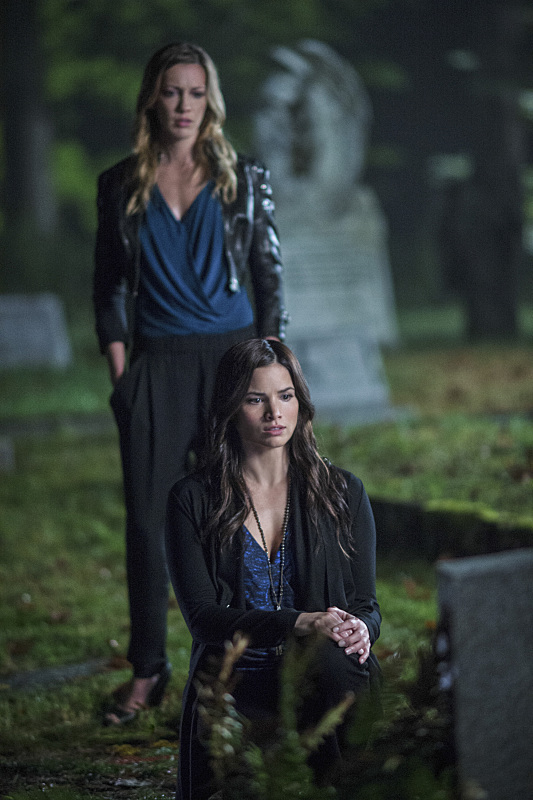 Laurel keeps her distance from Nyssa, as she blames her sister’s death on her involvement with the League of Assassins. However, when the archers track down Malcolm, Oliver lets him escape, only placing a tracer on him. He wants to get answers, while both Laurel and Nyssa only want revenge. Malcolm catches on to being tracked, and instead opts to meet Oliver in a public place. He reveals that he is only in Starling to keep an eye on Thea, since Oliver is so busy being the Arrow, and he swears on her life that he did not kill Sara. Oliver believes him, but Nyssa absolutely does not. After she learns that Thea is Malcolm’s daughter, and suspecting that this fact is what is obscuring Oliver’s judgement, she kidnaps Thea to summon Malcolm to her. Oliver intervenes, and the three archers fight. 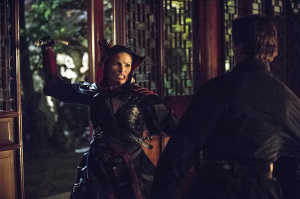 Nyssa is restrained with arrows, and Malcolm gives Oliver the opportunity to kill him, but Oliver lets him go. 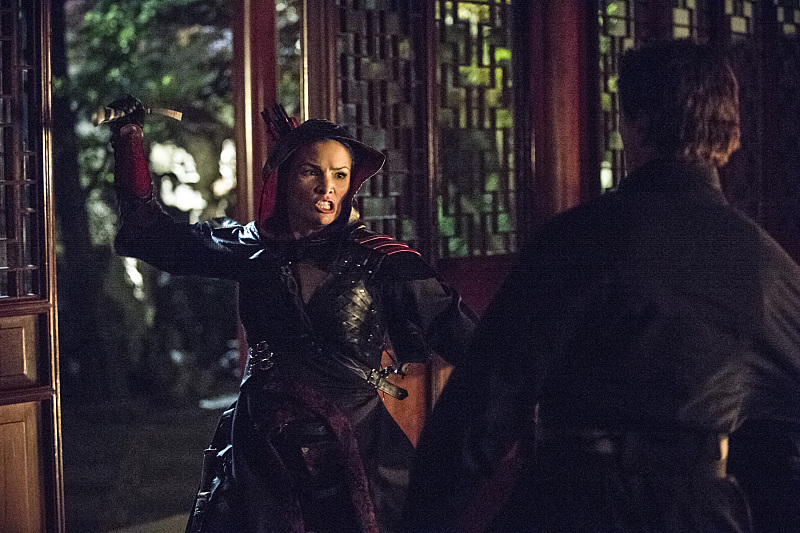 Nyssa, angry with Oliver, says he has made a powerful enemy in the League. Before she leaves Starling, though, she covertly gives Laurel her blessing to carry on Sara’s legacy. When Nyssa returns home to her father, Ra’s al Ghul, he mentions his dislike of Sara, who was never really one of them, and notes that Oliver Queen courts war with the League of Assassins. It’d be an understatement to say Oliver’s no-kill rule was integral to his development as a hero in the first two seasons of Arrow. His killing impulse caused the pivotal division between Oliver and Tommy at the end of season one, which propelled Oliver’s heroic arc throughout season two. His decision to not kill Slade was ostensibly the culmination of this arc, giving Oliver every reason to break his own rule, but having him creatively find a way around it and still come out a winner. From how it looked, that was it. Oliver’s the good guy, he redeemed himself of his season one murders, and the Arrow is finally the hero Starling needed. Except, you know, life goes on. Oliver will continue to face bigger bads that think they’re the first person to call him out on his no-kill rule, and they’re going to continue to push him and his friends to every limit. What “The Magician” explores, then, is where the line ought to be drawn. We know Oliver’s no-kill rule is valid, in that it saves his humanity and he saved way more people in “Unthinkable” than in the disaster of “Sacrifice.” But here, we have Malcolm Merlyn — someone Oliver basically “killed” once already, one who theoretically has more blood on his hands than any other character on this show. One who, as Diggle puts it, the world would be better off without. If Oliver were to ever break his rule, this would be the perfect opportunity. He doesn’t, of course. But while a lesser superhero show might use this to show our hero as righteous and honorable, Oliver’s decision to so closely abide to this rule may be causing more problems than it’s solving. He courts war with the League of Assassins now because he let Malcolm free, not to mention turning Nyssa from a shaky ally into a total antagonist. Oliver very well may have taken it too far by stopping Nyssa from killing Malcolm, all to press his views upon a person who literally kills for a living. It’s not a smart move for him, but Oliver has always been defined by being completely married to his mission or thought-process, even if becomes detrimental at times. In a sense, that’s the only way he’s ever been able to keep sane in the insanity; sometimes following these missions and rules so completely has caused problems, but he’s been able to win more in the long run by following his thought structure. It’s admirable to be committed to things, but “The Magician” leaves it ambiguous to whether or not he was right in this case. Nyssa was the perfect out to getting rid of Malcolm Merlyn without Oliver having to directly break his rule, but he instead took the supposed “high road” in making sure she doesn’t. And then he twists the knife further by saying Malcolm is “under his protection.” He’s essentially asking for more enemies, at this point. But then, Nyssa doesn’t really give him any choice, does she? In fact, she kidnaps Thea, an obvious soft spot for Oliver, so of course he’s going to go after her. Malcolm doesn’t really do anything villainous this week, and everything is pointing to Malcolm not being the killer. It’s never definitive whether or not he is, nor is any of this clear whether or not anyone is right. Laurel and Diggle both back Oliver and Nyssa at different points, and both Oliver and Nyssa are presented as right and wrong at different points, depending on who’s watching. And then we still contrast all this with Oliver in the Hong Kong, where he is able to kill so easily yet is still looking for a reason to do it. Is he going too far with his rule? Is there a happy medium he should be looking for between where he ends his 5-year-stint in hell and where he began this season in what felt like (but wasn’t) heaven? What works so well in “The Magician,” then, is that it makes the Sara murder mystery somewhat moot, in favor of focusing on what happens when Oliver’s rule is put to the test. That’s a smart way to draw out a mystery like this; there honestly aren’t many culprits that would be satisfying, with Malcolm mostly disproven, Ra’s al Ghul strongly hinted at, and Thea as a wild card (that’s less likely in a jump-the-shark way, but still not impossible.) So instead, the show lays out the possibilities rather overtly without answering them, and toys with the dynamic and psychology of these people as a result. That’s imperative, because it keeps the mystery relevant without making it terribly central. The reveal of Sara’s killer won’t be a shocking reveal of his/her identity so much as a culmination of all the arguments and feelings that death left in its wake. The fears of Sara’s death being purely for shock have been effectively quelled thus far by making the aftermath essential to this season, and “The Magician” isn’t any different. This all hinges on how much we care about and enjoy Katrina Law and John Barrowman as Nyssa and Malcolm, respectively. Law was something of a breakout guest star last season for her surprising and engaging relationship with Sara, and she’s not much different here. Law isn’t particularly subtle in her performance, but that works in the character’s favor. It’s a given that members of the League aren’t too in touch with their feelings and emotions, and what we learn about Ra’s suggest that Nyssa is an oddity. It’s telling when Barrowman spells out al Ghul’s shame and anger at his daughter being in love “degenerate” like Sara, which could be interpreted a handful of different ways, but is mostly likely that Nyssa is in love with another woman. As such, Nyssa’s anger and typical assassin coldness is totally founded; she’s never had the luxury of ambiguity or hiding her emotions. Like her mad rush to get Sara back in “Heir to the Demon,” Nyssa makes sure you know she’s mad when she’s mad, because she’s going to use it to get what she wants. She is the assassin equivalent of wearing her heart on her sleeve, and that makes her stand out in a cast of people harboring secrets and burying their feelings. Malcolm is actually remarkably similar, but is played far differently by Barrowman. Without a master plan outside of taking care of Thea, Malcolm doesn’t really have much going on. So Barrowman is using Malcolm as something a clean slate, a man who’s psychotic, smart, suave and still really angry, and who will snap at a moment’s notice when he needs to. Barrowman chews more scenery this week than he ever has — and that’s saying something — but that’s part of the charm of Malcolm’s villainy. He’s so sure of himself and his goals that he can confidently meet Oliver in the middle of a crowded plaza, and he can also scream something as cheesy as “I did not kill your beloved!” with absolute viciousness, and never worry about not getting his point across. Many of Malcolm’s lines are quite hammy, so Barrowman hams it up as much as he can, making Malcolm a consistently big character even when he isn’t doing much of anything (case and point: his reading of “It’s illogical!”) Not many actors can pull that off without bringing down the show, but this is the perfect mix of a charming actor and a character built for cheesy villain lines and pompous threats. Even still, Barrowmansneaks in a bit of humanity in Malcolm sometimes — not in the “good person” sense, but in that Malcolm can, actually, feel emotions other than visceral anger. Like his frightened revelation at the end of “Darkness on the Edge of Town,” Barrowman plays Malcolm as legitimately scared for a brief moment when Oliver pulls back his bow just before his escape. The intersection of Nyssa and Malcolm represents a culmination of the loose ends of seasons 1 and 2, which is what season 3 seems to be building itself on. Since season 2 was such a closed book ending, this season has been a slow burn in finding much of a hook outside of Sara’s death. That’s a hook for sure, but it’s not something that will carry the entire season. Instead, it seems we’re picking up smaller pieces of the first two seasons and molding them into something cohesive, like mixing different colors of playdough into one shape. This episode features numerous callbacks and references to The Undertaking, Slade’s attack on the City, and previous encounters with the League of Assassins, and is bringing out pieces of its aftermath — Malcolm’s survival, Thea’s encounter with the Deathstroke solider, teases of Ra’s — and fully forming them. Sara’s death has made them all unified instead of feeling like reheated leftovers, though, and the many connections are letting the show tell a new story by building on its old ones. This is also felt in the reveal that China White is involved in the flashback, and as the target of Edward Fyers on behalf of Amanda Waller, she ties the flashback saga in a nice little loop. It’s a little weird since it’s definitely a retcon, but even without Oliver ever acknowledging that he knew her, it creates a new dynamic between the characters and a new wrench in the flashback. “The Magician” excels in its new character dynamics, actually. Laurel keeping the secret from her father is still infuriating, but this week addresses how much worse it’s making the situation. Nyssa calls Laurel out on it, and frankly, it’s great. But Nyssa also gets some really nice scenes with Laurel, too, particularly their final scene in the gym. Laurel is effectively used for yet another episode this season, which is quite exciting; she contributes to the plot a bit at the beginning, but much of it has her rather at odds with Oliver even with them on the same side. Laurel provides a fiery, more subjective perspective on the events, and while she apologizes for pushing Nyssa too hard, you could argue why Laurel is in the right with some of her anger (but certainly not all.) She’s more volatile this season, and that’s making her more interesting and unpredictable, and gives better material for Katie Cassidy to play. On a smaller scale, Roy and Thea get some good scenes with their platonic dynamic, especially with Roy upfront about working with the Arrow. There’s a fantastic moment when Nyssa comes to grab Thea, where Roy does a fun little parkour stunt, only to get knocked out so Thea can strike a heroic fighting stance to protect him. It’s crazy how much closer these characters are to being viable superheroes, just in little moments like these. Even in spite of all the complexities, the surreal action is a huge highlight that rounds off “The Magician” from being simply contemplative to wholly entertaining. The archers fighting in the monastery, Malcolm dodging an arrow with the tilt of his head, and the ridiculousness of the Arrow, Nyssa, and the Dark Archer all fighting each other with no clear division of sides are things only this show could stage. The introduction of Ra’s al Ghul, while slightly underwhelming considering the build-up, is at least exciting in how it sets in motion a very different kind of all-out war. As such, “The Magician” is a solid effort to coalesce many events from the past three seasons, and continues to make the most of this season’s aura of mystery and uncertainty. We might not have any answers yet, but progressing with episodes like “The Magician” makes the wait just fine. With this review, I now realize how challenging it is to write the possessive form of Ra’s without it looking/sounding clunky. Thank goodness we know his last name. There’s lots of really dynamic cinematography this week, like the circling camerawork during the invisible ink burner scene and when Oliver and Malcolm meet in the plaza, and the interesting pull focus onto the spider web at the monastery when the team runs off. All those complicated theories about how Malcolm could have escaped the roof, or if he has healing powers, or used the Lazarus pit, or if someone rescued him, or if Diggle was in on it, etc…and it turns out “Malcolm has an in at the coroner’s office.” Occam’s razor, folks! 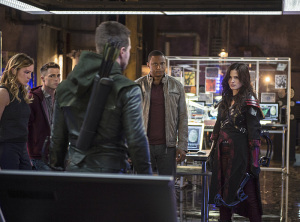 The sight of Oliver, Roy, and Nyssa all in hooded and masked get-ups with Diggle awkwardly standing there in civilian clothes makes the best visual argument of why Diggle needs a costume or mask. I can see the guy not being too into wearing hoods and leather because he’s too cool for it, but at least wear a hat or something, dude. It would also solve Oliver’s problem in rescuing Thea, too — he has to keep Diggle guarding the perimeter so as to not risk Thea seeing him. Which, you know, has a really easy solution. Diggle gets the best argument for Merlyn’s death: We all know how terrible Malcolm is, and while Oliver has the no-kill rule, Nyssa doesn’t. No matter what else happens, that’s the biggest wrinkle in Oliver’s zero tolerance, and it’s enough to make us question his decision even before it positions the League as an enemy. As usual, Diggle sees what’s obscuring everyone else. Now people just need to listen to the guy. Malcolm knowing about Oliver’s prison on Lian Yu alone makes him more formidable that Slade, in a way. It’s clear that his ridiculous levels of knowledge are going to be his defining method of staying on top this season. There’s some sick irony in having John Barrowman speak the “degenerate” line in light of Barrowman’s own status as something of a gay icon. But it’s great that the show is addressing it without being heavy-handed about it. Sara and Nyssa’s relationship isn’t (and shouldn’t be) defined by the fact that it’s homosexual, but the show is smart to not bury that, either, given the old-fashioned ways of the League. The episode does a nice job of acknowledging Felicity’s absence during her stint on The Flash without being too obvious, but kind of ruins it by having Felicity stumble in at the end asking what she missed. Not saying Felicity shouldn’t have appeared at all, but the awkward entrance — however quintessentially Felicity it is — cuts into the tension of that great confrontation. Training or not, it’s darkly funny that Thea pretty much totally brushes off being kidnapped at this point, not unlike her annoyed reaction to being kidnapped by Slade last season. So, we’re definitely saying the pool Ra’s gets up from is the Lazarus Pit, right? There’s a scene that summed up perfectly the simplicity and effectiveness of “The Magician.” The moment when Malcolm arrives at the location when Nyssa is holding Thea with Oliver there and says they need to talk. All three are masked and costumed, all three centered around archery as their form of offense and defense, and it’s absurb and fun in one fell swoop. What really works well for the episode is its propulsiveness. It rarely takes moments to rest and each that it does is a character beat before trucking on to the next scene or sequence. It’s actually an effective and engaging way to reintroduce Malcolm to Oliver. Even though we’d seen him since, it had been over a year since Oliver last saw the Dark Archer slumped over like a corpse on a rooftop just prior to the Undertaking’s devastating second wave. This speed gives them time to address all of Oliver’s emotions about seeing his nemesis alive without wallowing or dwelling in the weight of it all. That’s certainly there, and Oliver is very clearly affected by it, but the episode and season aren’t bogged down by it. The other advantage is that it allows for both Malcolm and Thea to keep the secret of their alliance away from everyone, particularly Oliver. One can’t help but find it easy to forget, at times, that Thea doesn’t know her brother is the Arrow. Everyone else is in on the secret and everything that she’s involved in is directly related to that aspect of Oliver’s life. The immediate reaction is to be confused by the clandestine nature of it, almost annoyed, especially with Thea and Roy acknowledging and accepting that he’s working with the Arrow. The realization quickly hits and it sets up a nice taut tension between brother and sister for the audience more than anyone else. Of course, tension is the new name of the game, as the episode has Oliver spitting at the League of Assassins’ feet, establishing that season-long arc. It works to the advantage of the season that they maintained the animosity between Oliver and Nyssa, even as they worked together against Slade Wilson last year. Sara was the buffer between the two and it made the antagonistic and contrary nature of their search to find Merlyn that much more believable. Standing between them was Laurel, and it’s nice to see yet another aspect that puts Oliver and Laurel on opposite sides of one another, even if they aren’t adversaries. This is going to make fantastic fodder for their future interactions as Laurel comes into her own. It’s intriguing how ultimately little Ra’s seems to care about Sara. This was Nyssa’s obsession, one it would seem Ra’s could’ve done without, and interesting how he’s using that for his own purpose. Expect that to play some kind of rift/role in their relationship as the season goes on. Have to say, though, that the Ra’s reveal was a bit underwhelming. On top of all of this, the retcon to include China White in the past timeline is a compelling, if headscratching, turn. It didn’t appear in the first season that Oliver was aware of her until he got involved in Triad business. Now, according to Waller, she’s the target that sparked the whole thing against Fyers. It was nice to see them start to address this connection head-on and relatively quickly on the season. I’ll reserve judgment on the effectiveness of the Chien Na Wei/China White involvement until we see more about. It was disturbing to see just how easily and efficiently Oliver can kill in the past, once he got past his initial objection of being Waller’s tool. Almost forgot that we’re working toward the cold, methodical person we saw at the start of the series. “The Magician” simply shows that the world is far more complex when everyone within your sphere of impact and influence is wearing masks. It’s still dealing with more set-up on the season, but it entertains the entire hour. It’s a bit funny to see so many people in costume on the show now — and how many are archers — but also quite cool. The show is fully immersed in its own world, and it works. That’s the best you can ask of any show. I do kind of wish that they would start finding new areas of the city to start filming meetings and action sequences. It’s sort of a necessity of production, but for the umpteenth time seeing a fight inside the maze of an industrial factory, the visual language of the series could use some sparks. To their credit, it was nice to see the raid by Oliver, Diggle, Roy, and Nyssa at the Buddhist monastery because it was such a different environment. Same goes with the meet between Oliver and Malcolm at the public plaza.